If there was ever an ideal merger between a Faroese and an Icelandic company, the 2004 takeover of Faroe Ship by Eimskip may well fit the bill—the transport services provider remains vital to linking the Faroes with the rest of the world. Back in 2004, Eimskip’s acquisition of Faroe Ship may have unsettled anyone in the Faroe Islands keen on keeping a solid, independent freight service in place. 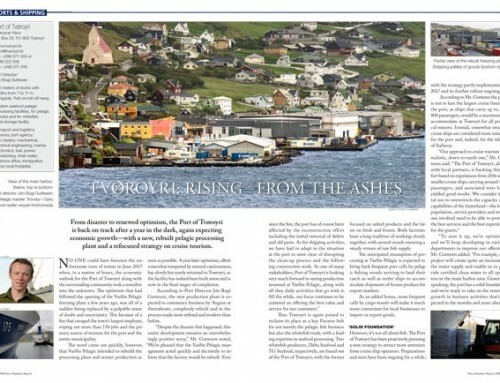 Twelve years on, however, fears about the potential loss of Faroe Ship’s traditional focus on the needs of the Faroese market have proved unfounded. As it turns out, the company’s offerings, more so than ever, are being tailored to meet domestic demand. With the two latest fleet additions—container vessels Lómur and Blikur, exclusively catering to imports and exports to and from the Faroe Islands—the services offered by Faroe Ship have been further refined in a highly competitive environment. 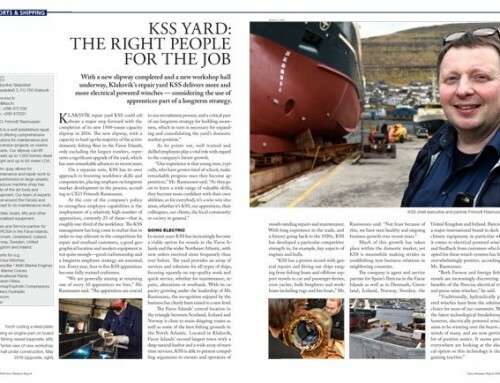 According to Mr. Nielsen, the integration between Faroe Ship and Eimskip has proved highly successful. In a new route dubbed the ‘Grey Line’, fresh and frozen seafood from the Faroes are shipped twice a week with Lómur and Blikur to the UK and to Scandinavia and Continental Europe. On the return route, the vessels bring imports to the Faroes via port calls in the UK, Denmark, Norway/Poland (every other week), and Sweden. 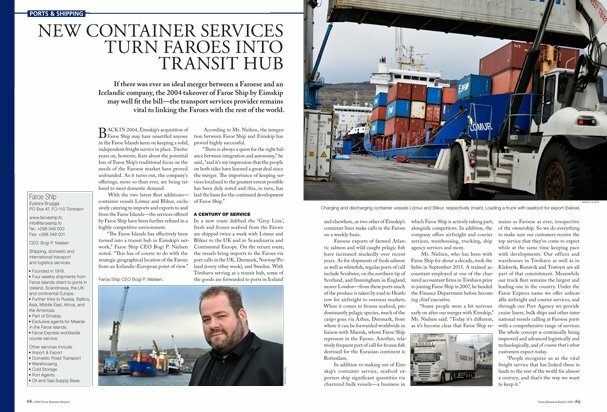 With Tórshavn serving as a transit hub, some of the goods are forwarded to ports in Iceland and elsewhere, as two other of Eimskip’s container lines make calls in the Faroes on a weekly basis. Faroese exports of farmed Atlantic salmon and wild caught pelagic fish have increased markedly over recent years. As for shipments of fresh salmon as well as whitefish, regular ports of call include Scrabster, on the northern tip of Scotland, and Immingham in England, nearer London—from these ports much of the produce is taken by road to Heathrow for airfreight to overseas markets. When it comes to frozen seafood, predominantly pelagic species, much of the cargo goes via Århus, Denmark, from where it can be forwarded worldwide in liaison with Maersk, whom Faroe Ship represent in the Faroes. Another, relatively frequent port of call for frozen fish destined for the Eurasian continent is Rotterdam. In addition to making use of Eim­skip’s container service, seafood exporters ship significant quantities via chartered bulk vessels—a business in which Faroe Ship is actively taking part, alongside competitors. In addition, the company offers airfreight and courier services, warehousing, trucking, ship agency services and more. Mr. Nielsen, who has been with Faroe Ship for about a decade, took the helm in September 2015. 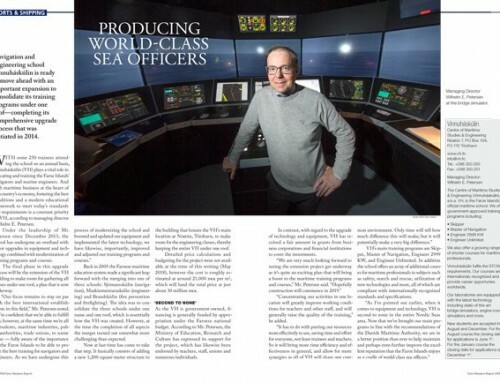 A trained accountant employed at one of the chartered accountant firms in Tórshavn prior to joining Faroe Ship in 2007, he headed the Finance Department before becoming chief executive. “Some people were a bit nervous early on after our merger with Eimskip,” Mr. Nielsen said. 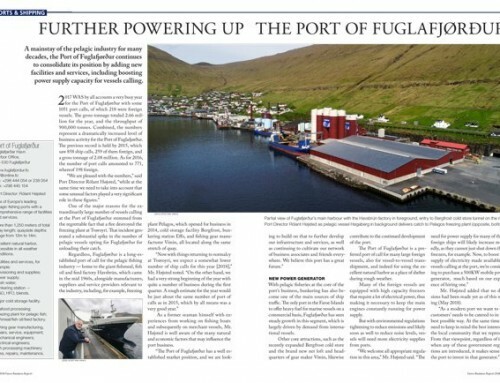 “Today it’s different, as it’s become clear that Faroe Ship remains as Faroese as ever, irrespective of the ownership. So we do everything to make sure our customers receive the top service that they’ve come to expect while at the same time keeping pace with developments. 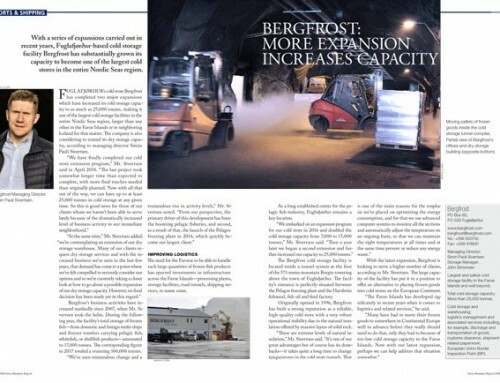 Our offices and warehouses in Tórshavn as well as in Klaksvík, Runavík and Tvøroyri are all part of that commitment. Meanwhile our truck fleet remains the largest and leading one in the country. Under the Faroe Express name we offer unbeatable airfreight and courier services, and through our Port Agency we provide cruise liners, bulk ships and other international vessels calling at Faroese ports with a comprehensive range of services. The whole concept is continually being improved and advanced logistically and technologically, and of course that’s what customers expect today.